Millennia NSEQ-2, Software parametric EQ from Brainworx. Today's X-Mas calendar offer at Plugin Alliance allows you to get Brainworx's Millennia NSEQ-2 equalizer plugin cheaper than ever. 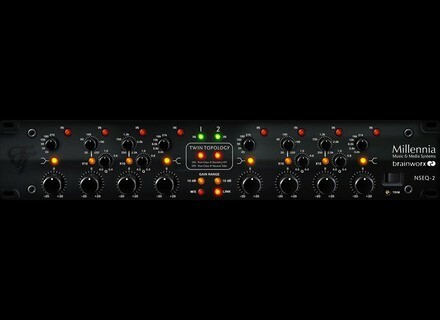 Today December 12th, Brainworx's plugin rendition of the Millennia NSEQ-2 mixing/mastering equalizer is available for $129 instead of $299 at the Plugin Alliance's website. In addition to being announced as faithful as possible to the original hardware, the Millenia NSEQ-2 plugin also includes features not found in the hardware version such as M/S processing, link mode and output trim control to benefit from the NSEQ's coloration without overloading whatever follows in your signal chain. Visit this page to benefit from this offer. 50% off Sonokinetic's Grosso today only The second of their "12 Days of Christmas" sees Sonokinetic offer its Grosso virtual orchestra at half price. Name your price for Soundtoys' "Little" plugins Soundtoys gives you the opportunity to get their "Little" plugins at the price YOU wish to spend, with the whole amount going to charity.